The Ladakh plateau, more than 3000m high, is an arid Himalayan region of Tibetan culture. The main source of water for people living in Ladakh comes from mountain glaciers. Because of climate change, glaciers in Ladakh are retreating. Water resources are getting too scarce for farmers and the whole valley is now at risk of slowly disappearing. 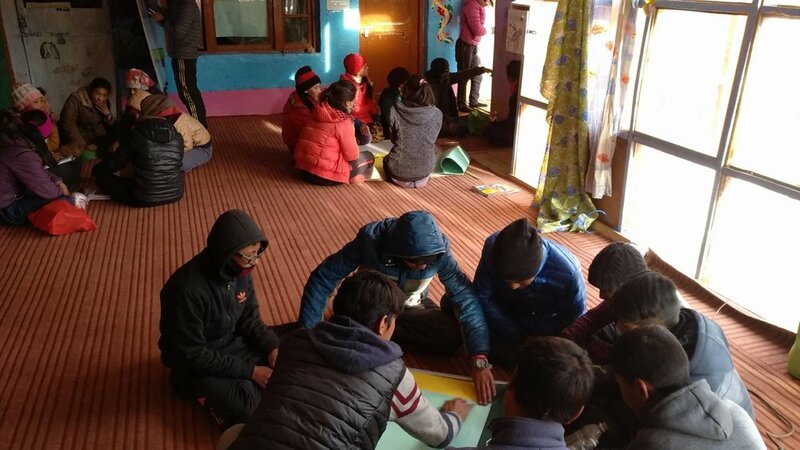 Following its success in 2017, Slow Motion Projects wants to further enable the Youth Association Gya's action by supporting the organisation of a second sustainability winter school at the end of 2018, allowing 80 local students to gather and incubate ideas about sustainable development for Ladakh. The school will be free for participants, and will enroll an equal number of men and women in order to support gender equality. During a 20-day boot camp, students from Gya and villages around will attend workshops and conferences helping them to develop their own ideas in area such as eco-tourism, organic agriculture, or handicraft production and retail. To promote the school and raise funds for the next edition of the winter camp in 2019, students will prepare a theatre play addressing climate and environmental issues in Ladakh and present it on the last day of the program at the village community hall. Mingyur Rigzen is a young Ladakhi who completed his studies in environmental sciences in the renown Students' Educational and Cultural Movement of Ladakh (SECMOL) school. Mingyur does not want to see his native Ladakh valley dying. At the age of 25 years old only, he has already become a successful social entrepreneur. In winter, Mingyur manages the team of the Ice Stupa project, whose goal is to create artificial glaciers in Ladakh. In the summer, the peak season for tourism, he works as a nature guide and runs ecotourism lodges in his village. A few year ago, Mingyur created the association "Youth Association of Gya". Their mission is to help young Ladakhis to protect their region while allowing it to resist the economical consequences of climate change.